Are you hunting for regular updates for your social media account, however do not want to employee someone for this work? There is no doubt about the fact that it takes time and tons of effort to keep one’s social media feeds fresh and updated. You need not worry as we have an experienced team to do the promotion for you. We can create content and post on your behalf, at the perfect volume for each platform. Our experts will profile your company and create a tailored posts/tweets that go out 5 days a week. You probably like many others must have heard about Social Media Marketing. But, do you know what is it and how productive could it be for your social media accounts? This is a technique through which you can promote your products and services efficiently through social media platforms such as Facebook, Instagram, Twitter, LinkedIn and so forth. This is one great technique of improving your presence online, before your target set of clients and customers. There are so many people who only think that Social Media Marketing Service is only there for one good. They think this practice only helps you to attain new customers through social media sites like Facebook, Instagram, etc. Yet, this is only one small benefit you gain through this service. There are so many others you can enjoy through the productive campaign of social media. You will gradually start to notice growth of your website conversion rates. People online feel secure and reassured when they notice regular updates of social media feeds. Here we mean updates that are done hourly and not days! This also reveals that you are quite professionalism in approach. This very distinctly reveals the fact that your site is at all times, accessible for business. When talking about traditional advertising, it is stated that a customer who will most likely buy the product, would require seeing the ad at least seven times. However this makes it a greater chance for you to make most of the moment. You will be able to display your products before your potential clients, without getting over the top pushy. Are your contenders making the best of social media platform? Are they using one? It is probably that many of your competitors would not do a great work in the area of social media. This would be a great opportunity to march ahead of them. In case they are also trying their best to get engaged with social media, always try to come up with new techniques that would click for you. As you notice the number of followers on your list starts to grow, you will start to increase your marketing power too. The more followers one has, the more others around would want to join in and notice what’s going on. Always remember that people are always on the hunt for the “crowd effect”. They would want to know what the crowd is interested in, they would not mind to join the crowed anytime soon. When people see you have a busy social network with hints and trivia relating to your chosen business field they will automatically associate authority with it. Your business will be seen as having increased credibility and specialist knowledge which, in turn, will also increase your sales conversion rates. You’ll never see a better return on investment than a well-run social media campaign. Google is now returning social media results in amongst its search results and Twitter and Facebook have literally hundreds of millions of users. You can get access to this market for a tiny monthly investment when compared to other marketing channels. 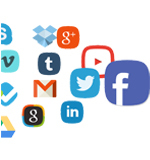 Google has placed more and more prominence in what are commonly referred to as "social signals". We’ve found the very best way to get an SEO benefit from your social media campaign is to embed your Twitter feed into your website. This constantly changing text will help propel your website up the rankings, resulting in more visitors and more sales. We'll embed the feed into your site and make it look good. 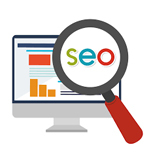 This goes hand in hand with SEO – because Google will be giving you more traffic – but as your social media campaign grows and matures you will also see more and more direct traffic from the social networks. Powerscribe is one of the leading Digital Marketing Company in UK. We will profile your business, looking in detail at your products and services and then we'll implement a social media strategy based on Twitter, Facebook and LinkedIn. We'll tweet and post regularly throughout the business day with appropriate hashtags. So, contact us today to improve your business. If you're thinking about growing your business, we can help you reach the next level.